Why should only authors be allowed to opt for the less restrictive CC BY license “if required by funding institution”? 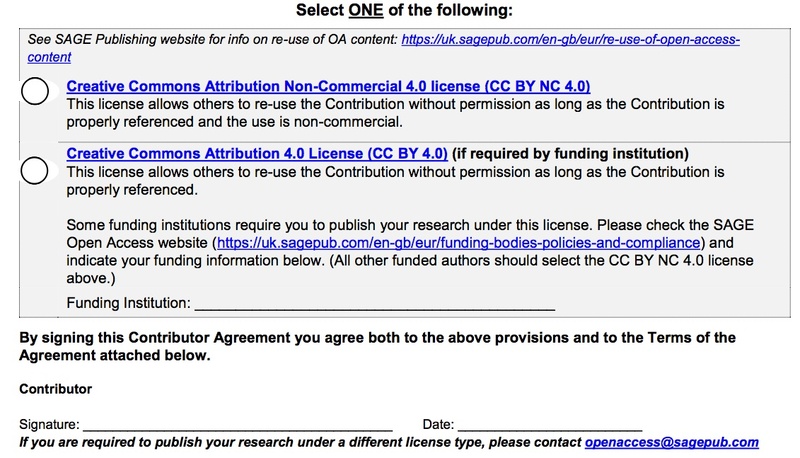 And why should “all other funded authors […] select the CC BY NC 4.0 license”? At least, it should be the authors choice, given that open access clauses are remunerated in the respective deals. A practical consequence of using a Creative Commons license with the NC clause for a scientific paper is that images and excerpts beyond quotation exceptions cannot be integrated into collaborative knowledge projects such as the free online encyclopedia Wikipedia. Wikipedia’s license is compatible with CC BY or CC BY-SA but not with licenses with a NC module. Also, integrating parts of research works into openly licensed teaching materials (Open Educational Resources) is hindered by the use of an NC clause. Trying to get authors to agree to a NC license really goes against the spirit of open access. Of course, SAGE is not the only publisher endorsing very restrictive Creative Commons license under the open access label. Elsevier, for example, endorses the even more restrictive CC BY-NC-ND license for self-archiving (“green open access”); authors paying for open access to individual articles (“hybrid open access”) may choose between either CC BY or said CC BY-NC-ND licenses. SpringerNature’s Open Choice policy, in contrast, just recommends using CC BY as a license standard. It would be interesting to know how widespread practices such as the one documented above are. (I have been thinking about launching a public repository for copyright forms of various publishers for a while now). In any case, future open access deals need to be much more specific regarding open access licensing conditions. Seemingly, even when being remunerated via open access deals, some publishers are only willing to concede as much ground as absolutely necessary. A similar version of this post has been published in German at netzpolitik.org. In my opinion NC should not be called “open” and ND should not be called “science”, because science is always building upon the work of others. Looking at the experience in the world of software and open data, I propose to go with CC-BY-SA to make sure that derivatives are open as well. So, naturally, when I started our open science journals on https://moringa.pub/ojs/ with some friends we decided to use cc-by-sa by default and also accept cc-by or cc-0 if the authors insist. But nothing “less open”.